Editor’s Note: The United States invaded Iraq on March 19, 2003, insisting that the Iraqi government possessed “weapons of mass destruction” that posed an imminent threat to world security. These claims were later shown to be bogus, but the damage was done: a shattered country in which millions became refugees and as many as 1.4 million people were killed. While millions of people demonstrated worldwide against America’s invasion plan, including thousands of Winnipeggers, an astonishing number of people believed the US was justified. It was to these gullible people that Carl Ridd’s words were addressed. Re-reading them ten years later, as the United States, France, and to a lesser degree Canada invade Africa on the pretext of fighting terrorism, one is struck by their continuing relevance. 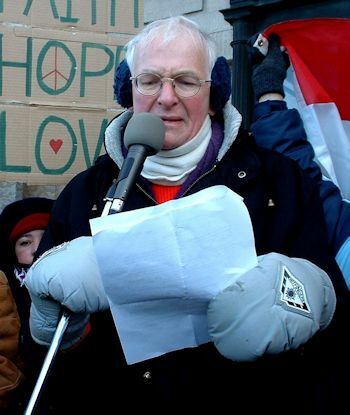 Carl Ridd, a beloved Winnipeg peace and social justice activist who died March 29, 2003, penned this article from his hospital bed on March 8, 2003. An urgent crisis is upon the world in Iraq. But it is not the crisis that the U.S. says it is or that the ignorant media repeat endlessly every day. It is not the crisis that under the American stampede has become the one under consideration. This substitution of a lesser, arbitrary and artificial crisis for the real one that becomes more visible every day (but is far less spoken about) is the crisis the world has on its hands. The real crisis then is over whether it is right to rush to this particular slaughter for the unconvincing reasons offered by the Bush Administration, while the real reason (world control via oil) remains politely unuttered and unaddressed at official levels. Are the world’s people and just institutions of world governance and behaviour to be sacrificed to the impressive tyranny of a superpower in a rage to conquer? This potential war (read “slaughter”) in Iraq is upon us for one reason only: the greatest superpower the world has ever seen has the political and military power to force a putative “life-and-death” issue—“Weapons of Mass Destruction” (WMDs) —with this particular country at this particular time. The crisis is artificial, contrived, and entirely due to U.S. determination to force a “war” in order to gain control over Iraq’s oil. The U.S. has achieved its potent new focus on Iraq’s WMDs after trying several other, less successful, excuses—humanitarian responsibilities, “regime change,” “leadership change,” democratization, “the axis of evil,” and the “terrorist” connection between Iraq and the events of 9-11. (The last of these has been surprisingly effective. By now, 50% of Americans believe that Saddam Hussein and the Iraqi regime were responsible for the September 11 bombings, though no evidence of any such connection exists: of the 19 hijackers that day, 14 were Saudis, four were Egyptians, and one was a Syrian). The Bush Administration has achieved its dangerous focus by an incessant media (propaganda) attack, by capitalizing on the sympathy that 9-11 aroused around the world on behalf of Americans, by buying votes in the Security Council, and, possibly, by the promise of post-“war” oil. The marketing of the “war,” both in the U.S. and abroad (keeping in mind that 90% of the world’s “news” is manufactured in the U.S.), has been handled by a consortium of 25 American P.R. firms so that every day for the last six months, Iraq has been named by a high ranking American official as the world problem which must be addressed, always with a short term deadline attached. Several dates for launching a U.S. war on Iraq have been given. All are said, by the U.S. and its few supporters, to be deadlines set by the weather. In reality, the war the U.S. proposes, with its “Shock and Awe” hi-tech carpet bombing of civilians and their life-means (food, water, electricity, hospitals, transport, etc.) can be conducted in any season. The abrupt deadlines are not, in fact, weather-related but are brutally calculated to stop the leakage of popular support at home for a “war” that even Americans can see is the “mother of all gambles” (Thomas Friedman of the NY Times, in the Free Press of March 4, 2003)—for the world community and for themselves. The U.S. Administration knows it has only a few days to make its agenda popular again at home: start the war, rally round the flag, inflame patriotism, silence growing dissent at home, identify the dissenters as traitors allied with terrorists—and get into and dominate Iraq before other alternatives (enforced U.N. inspections, enforced co-operation by the Iraqi dictator) gain more ground. The deadlines are phony and deliberately abrupt; they exist precisely to limit time for careful thought, informed debate, and wise political manoeuvering. And they underscore the real crisis that the world is currently facing. The real crisis the world has on its hands is the fact that a single nation now has the capacity to control the world’s agenda, naming enemies, targets, dates, and “reasons” for a war—all as suit its own national interest at any given moment and all backed by its staggering military resources, its enormous financial resources, and its fierce, myopic will to do what it chooses, regardless of the consequences for the rest of the planet’s people.